(Washington, DC) ' October 11, 2007 ' This evening, hundreds from local barns and organizations from Washington, DC, Maryland and Virginia regions attended the 49th Annual Washington International Horse Show, competing for top prizes at the ULCERGARD Barn Night. This year's Barn Night was sponsored by Merial, the maker of ULCERGARD' (omeprazole), the only FDA-approved product proven to prevent stomach ulcers in horses. Winning barns for each category included: Stonewall Farm from Ashburrn, VA for the Essay contest; Urbana Riding Club from Frederick, MD for the 'Design a Ring Wall Banner' contest; South Carroll Equine Club from Mt. Airy, MD for the 'Derby Hat' contest and Misty Brae Farm from Chantilly, VA for the new WIHS mascot name 'Oxer' in the 'Name the Mascot' contest. Each winner received a muck bucket full of barn and stable supplies (valued at more than $500 each), courtesy of The Loft at Meadowbrook. The Grand Champion Barn was awarded Devaux Farm from Philmont, VA for the highest number of participants, best spirit, creativity and enthusiasm throughout the evening. Devaux Farm took home a saddle cleaning stand provided by the Georgetown Stable Outfitters. WIHS also awarded Iron Bridge Hounds Pony Club from Woodbine, MD, a Kawaski Mule during the final chance drawing of the evening. Throughout the evening's festivities, attendees walked the Gambler's Choice course with select riders, garnered rider autographs and won a variety of prizes and merchandise. 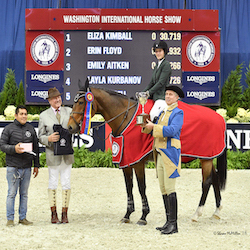 The Washington International Horse Show (WIHS), a 501 (c) (3) charitable organization benefiting local and national charities, is a world-class championship event, drawing leading equestrian riders from around the nation and the world. Each year riders participate in qualifying shows to earn the honor of riding at the WIHS. The WIHS welcomes more than 600 horse and rider duos to compete to win some of the most coveted and prestigious awards in the world, including more than $400,000 in prize money. The show takes place every October in Washington, DC, attracting the attention of the equestrian world, non-equestrian world, celebrities and politicos alike with events such as show jumping, dressage, barrel racing and terrier races. October 2008 will mark the 50th anniversary of the WIHS.